Piper Alpha was a North Sea oil production platform operated by Occidental Petroleum (Caledonia) Ltd. The platform began production in 1976, first as an oil-only platform and later converted to add gas production. An explosion, and the resulting oil and gas fires, destroyed it on 6 July 1988, killing 167, including two crewmen of a rescue vessel; 61 survived. The total insured loss was about £1.7 billion (US$3.4 billion). At the time of the disaster, the platform accounted for approximately ten percent of North Sea oil and gas production, and the accident was the worst offshore oil disaster in terms of lives lost and industry impact. The Kirk of St Nicholas in Union Street, Aberdeen has dedicated a chapel in memory of those who perished and there is a memorial sculpture in the Rose Garden of Hazlehead Park in Aberdeen. Thirty bodies were never recovered. Twenty-eight years ago today 167 oil rig workers and the crew of safety vessels died in the Piper Alpha disaster. We must not forget. At nine-thirty on a July evening in 1988, a disastrous explosion and fire occurred on the Piper Alpha oil-drilling platform in the North Sea off the coast of Scotland. One hundred and sixty-six crew members and two rescuers lost their lives in what was (and still is) the worst catastrophe in the fifty-year history of North Sea oil exportation. One of the sixty-three crew members who survived was Andy Mochan, a superintendent on the rig. From the hospital, he told of being awakened by the explosion and alarms. Badly injured, he escaped from his quarters to the platform edge. Beneath him, oil had surfaced and ignited. Twisted steel and other debris littered the surface of the water. Because of the water’s temperature, he knew that he could live a maximum of only twenty minutes if not rescued. Despite all that, Andy jumped fifteen stories from the platform to the water. Mr Cleland's speech described the explosion in terms which are much simpler than the Wikipedia article. Here is the relevant extract (quoted without permission -- my apologies). I found out that a small explosion had occurred shortly before the first big explosion, which happened at about 10pm. The disaster began with a routine maintenance procedure. A pump in the processing area needed to have its pressure safety valve checked every 18 months. It was due for a check. The valve was removed for maintenance, leaving the pipe open. The worker who had taken the valve off the pipe, had replaced it with a blank flange and secured it to the pipe opening. That was stated at the public inquiry by this workers supervisor. Because the workers could not get all the equipment they needed by 6 p.m., they asked for and received permission to leave the rest of the work until the next day. But later in the evening during the next work shift, a little before 10 p.m., the primary condensate pump failed. The people in the control room, who were in charge of operating the platform, decided to start the backup pump, not knowing that it was under maintenance. Gas products escaped from the hole left by the valve, which ignited and exploded. The firewalls were not explosion proof. The force of the explosion blew down the firewall separating different parts of the processing facility. Heavy oil equipment was damaged and before long large quantities of stored oil was burning out of control. The automatic deluge system, which was designed to spray water on such a fire in order to contain it or put it out, was never activated because it had been turned off. The water out lets had been blocked off for over 2 years. About twenty minutes after the initial explosion, the heat from the fire ruptured the gas line, resulting in a catastrophic gas explosion. The jet of fuel dramatically increased the size of the fire from a billowing fireball to a towering inferno. At the fire’s peak, the flames reached three hundred to four hundred feet in the air and could be felt from over a mile away and seen from eighty-five. The crew began to congregate in the living accommodation area, the part of the platform that was the farthest from the blaze and seemed the least dangerous, awaiting helicopters to take them to safety. There was no sign of a rescue helicopter for 1 hour and 35 minutes. The first helicopter was an RAF rescue helicopter. At no stage was there a systematic attempt to lead men to escape from the accommodation area. Those who tried to find a means of escape found that smoke and flames blocked all routes to the lifeboats. Many therefore headed back towards the accommodation area. There they were mostly protected from the heat and flame for a while, but not the choking smoke. Men began to lie on the ground with wet rags over their mouths and faces. Some of them realised that they might die. Eventually like the other platforms on the Piper Alpha the accommodation platform slowly collapsed and slipped into the sea. There were 229 men on the platform at the time. 62 were on night shift duty while the remainder were in the accommodation. It is difficult to imagine what it must have been like for these men. Some people realized that the only way to safety was to jump into the sea. Men ran to the railing, only to see a daunting drop of over a 150 feet to the surface of the water, lit by the patches of flaming oil floating around the platform. Those who jumped had to alternate between staying underwater and freezing in the North Sea and keeping their heads in the air to cook. Those who stayed behind died of carbon monoxide poisoning and some also died of burns. Stories from survivors illustrate how horrible the situation was. One man had just come to the platform that day and had no idea where he was or how to get around. All he could see was that he was on a walkway high up in a cloud of smoke. He made the decision that it would be better to die from jumping and hitting the deck than from burning alive. He jumped, fell into the ocean, and was one of the lucky ones who survived. Another man – who survived - was heard to call out a repeated request for anyone who worked for the same company as he did. When asked afterwards why he would do such a thing in such a situation, he replied, "I didn’t want to die alone." 62 persons survived and 167 were killed. 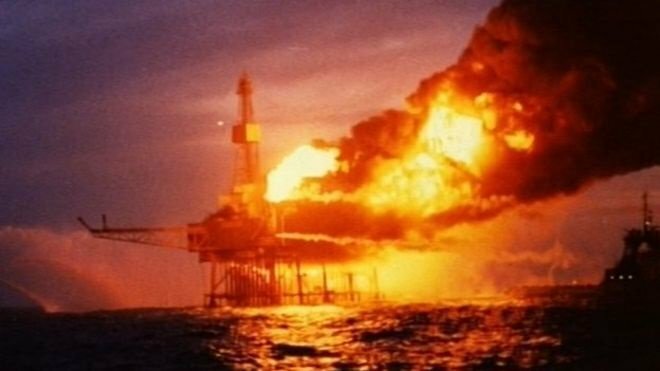 The Offshore Post (link below) has a detailed timeline of the incidents in the Piper Alpha disaster. The controversy around it was heightened when a report into the disaster by Lord Cullen judged that the operator Occidental Petroleum had used inadequate maintenance and safety procedures. He made more than 100 recommendations about how safety should be improved in the North Sea. Along with other oil companies, Occidental had massively scaled back spending as the price of oil had plunged from more than $30 per barrel to $8 in the 1980s compared to today's level of more than $100. And here is a video on the disaster. Today, the "burning platform" is used as a metaphor in change management. As Daryl Conner has explained, the Piper Alpha survivors who jumped "chose possible death over certain death". Those who stayed on the platform were certain to die. Those who jumped from 15 storeys high could hit the platform and die, but it was possible that they would survive. When companies feel threatened by the changing circumstances around them, they know that they have no choice but to change. The "burning platform" metaphor is a convenient way for them to understand that they have no choice but to leap off the platform, or die. Today, the burning platform metaphor is widely accepted and used in sparking change management initiatives. But we should always remember the context from which it was derived. We owe ourselves a duty to remember the Piper Alpha disaster so that they appreciate the metaphor in full. It's not just some management consulting stuff. Wikipedia, entry on Piper Alpha. Conner Partners blog, The Real Story of the Burning Platform by Daryl Conner. The Guardian, 4th July 2013. Piper Alpha disaster: how 167 oil rig workers died by Terry Macalister.